In 1997 the D.A.ST. Arteam completed the monumental piece Desert Breath, located between the Red Sea and a body of mountains in the Egyptian desert. The construction works both as a visual image from above and as a spiral pathway from the ground. 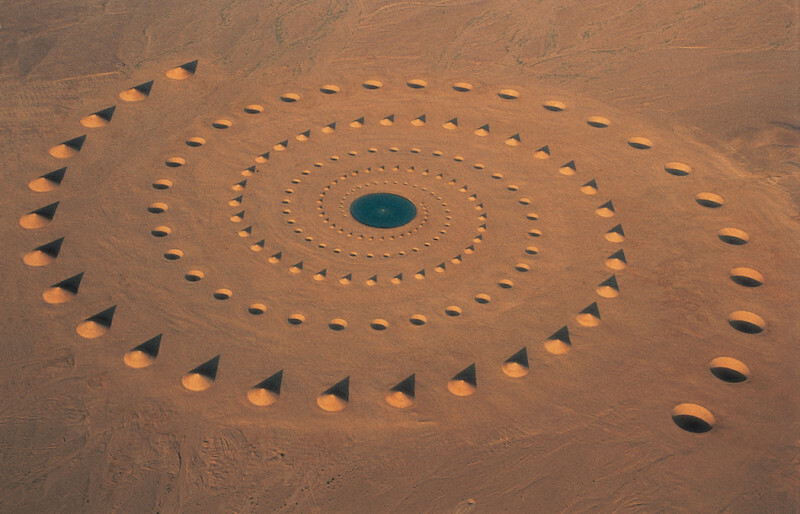 It consists of 8.000 cubic-meters displaced sand which forms positive and negative conical volumes and describes the shape of “two interlocking spirals that move out from a common centre with a phase difference of 180 degrees in the same direction as rotation.” The centre, a 30 meter diameter vessel, was originally filled with water but as the years pass the piece continuously transforms and becomes one with the infinity of the desert. Although it is slowly disintegrating, it stands as an instrument to measure the passage of time. You can explore the artwork as it looks today here on Google Maps.